Provides developers functions, protocols to interact with the database and do actions with any software or application. 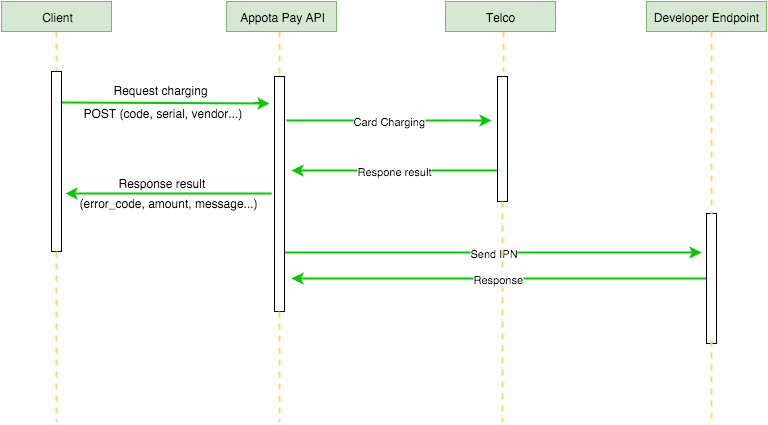 Appota Pay API was built to deploy applications CARD, SMS, BANK on various programming languages. Payment gateway will be integrated more easier than ever with this protocol. - Possible to connect in all common programming languages: PHP, C#, JAVA, PYTHON. - Supporting most of payment services: CARD, SMS, BANK. CARD: Support payment by scratch phone cards or game cards. SMS: Support payment via text messages to short codes. BANK: Support payment via internet banking. Step 1: Client call to Payota’s API to get payment information. The information is returned link to payment site. Step 2: Client conduct payment on payment site of Bank side. Step 3: After Client sent payment requirement, Payota get payment information from provider , and calling to IPN url of Developer (which has been config during making application). After all, Developer will conduct to topup items, services, coin for client. Step 4: Developer close payment window, then call to API to check transaction, showing notification on Client and finishing transaction. Step 2: Developer conduct POST parameters to API of Appota Pay. Step 3: Appota Pay conduct to charge scratch card via Telco’s confirmation before send resuit to client, and calling to IPN url of Developer (which has been config during making application) at the same time. After all, Developer will conduct to topup items, services, coin for client. Step 4: Sending notification with successful transaction to client and finish transaction. String vendor = "vendor";//ex: viettel,vinaphone.. Copyright © 2016 AppotaPay Inc. All rights reserved.